Rugal Bernstein is an incredibly rich and notorious arms and drug trafficker, as well as an incredibly skilled and ruthless fighter. Having become bored with the lack of competition, Rugal decides to host a new King of Fighters tournament. Rugal has his secretary travel to eight destinations around the world and invite fighters to his new tournament. Unlike the previous KOF tournaments depicted in the Fatal Fury series, the new King of Fighters is a team tournament, with eight teams of three, each representing a different nationality, participating this time. Most characters come from other SNK games, such as Team Italy, which is composed of three heroes from the original Fatal Fury: Terry Bogard, Andy Bogard and Joe Higashi. The two heroes from Art of Fighting (Ryo Sakazaki and Robert Garcia) are featured along with their mentor and Ryo's father (Takuma Sakazaki) make up Team Mexico. Team Korea features Kim Kaphwan from Fatal Fury 2 as the leader of two convicts he's trying to reform Chang Koehan and Choi Bounge, while Team England is a mix of female fighters from Fatal Fury 2 (Mai Shiranui) and the Art of Fighting series (Yuri Sakazaki, King). The two heroes from Psycho Soldier (Athena Asamiya and Sie Kensou) form Team China along with their mentor, Chin Gentsai. Similarly, Team Brazil features the heroes from Ikari Warriors (Ralf and Clark) along with their commanding officer Heidern. Additionally, the game features two teams composed entirely of original characters: Team Japan featuring Kyo Kusanagi, Benimaru Nikaido and Goro Daimon, and Team USA composed of Heavy D!, Lucky Glauber and Brian Battler. 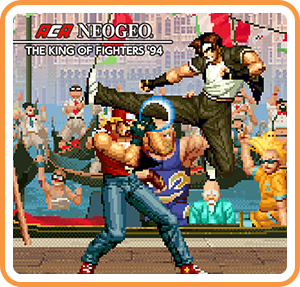 Where can I buy ACA NEOGEO THE KING OF FIGHTERS '94 physical/digital?